You know how I have always shared Sabyasachi lehenga prices with you before. Well, most of them, unfortunately, have been the basic lehengas with one or two real bridal Sabyasachi lehengas. But today is exceptionally good. I have with me a total of 29 Bridal Sabyasachi Lehenga Prices! Usually Sabyasachi bridal lehengas, the real brides wearing ones typically cost from INR 3.95 lakhs to INR 7 Lakhs. If you have a budget of INR 3-4 lakhs, you will easily find gorgeous heavy bridal Sabyasachi lehengas with two dupattas. Before I start, I just want to say, thank you Anushka. This sweet angel emailed me late last night about Bridal Sabyasachi Lehenga Prices, and boy, did she make my day! I bet for some of you all who are seriously considering wearing Sabyasachi for your wedding, this post will give you a lot of ideas on what your budget should be. The reason why I have been putting up these Sabyasachi Lehenga cost posts is that majority of you think Sabyasachi is too expensive. While it is true but expensive is a subjective term. While 2 lakhs might be too much for some, for others 4 lakhs might be a doable budget. The idea behind this blog post is to know your options. That dream lehenga of yours might just be within reach. If not, you can always start saving early on. Ok, enough gyan. Here’s a list of Bridal Sabyasachi Lehenga Prices from 2019 and previous bridal collections. Sabyasachi’s vintage Benarasi lehenga set is a fitting choice for a destination wedding. The heritage weave keeps the tradition intact while the blouse keeps it from being too conservative. Sabyasachi red Madagascar lehenga is a masterclass in wearing red to Indian weddings. The right contrast of decadence and simplicity makes this apt for a mehndi or sangeet soiree. I am honestly surprised to see this lehenga back on a 2019 real bride. This red Sabyasachi lehenga is one of the older ones from his previous collections. I, in fact, featured this very lehenga in my other post on what Sabyasachi lehengas cost back in 2016. If you are a budget bride to be and want a Sabyasachi simple bridal piece in under INR 2 Lakhs, this is your chance. You really should check with the designer’s team if some options are available. Seeing this bride makes me just so happy and hopeful for all you budget brides out there. Fingers crossed this lehenga price remains constant, coz this ones totally worth spending on. Sabyasachi’s Meena buti lehenga is a signature must-have that is appropriate for all ages. Sabyasachi’s silk Waheeda lehenga dips into old-world glamour for inspiration. Maybe black won’t be an appropriate choice for a bridal piece. But you can check with the designers’ team if they can do the same in red, maroon or any other bridal colours. I am sure I’ve seen some bride somewhere in one of these creations in a deep red recently. If I find a picture, will put it up for inspiration. Sabyasachi’s Tahiti lehenga set combines a burst of colours in a nature-inspired pattern, balanced by the ebony blouse. Perfect for a sangeet. Real bride Neha Kent in Sabyasachi for her wedding in Melbourne, Australia. Real groom Joel Kino in a Sabyasachi sherwani. I bet you have seen real brides wearing various versions and colours in this particular Sabyasachi lehenga. Well, now you know what it costs. In the picture, it does look like it comes with a single dupatta only. But you can check with the team if they can arrange for a second dupatta at a reasonable cost. Now, this is where the real Bridal Sabyasachi Lehengas start. If you really want to wear one of those exquisite wedding lehengas, then be ready to shell out at least INR 3.95 Lakhs for a single lehenga. They look gorgeous, and every single one of them is an heirloom piece to collect. If you don’t want to wear a typical traditional bridal lehenga for your wedding, go for these floral ones instead. They are different and yet, look beautiful for a bridal look. Real bride Sheetal Mudumba in a hand-painted and embroidered Sabyasachi lehenga from The Udaipur Collection for her wedding in Melbourne, Australia. Remember this gorgeous raspberry Sabyasachi lehenga blogger bride Aayushi Bangur Sahu wore? This particular Sabyasachi wedding lehenga comes in a range of shades that you can opt for. Which colour was your favourite among these four? A recent 2019 Sabyasachi wore the same lehenga in a slightly darker grey tone for her wedding in New Jersey, USA. Sabyasachi’s Gulabo lehenga should be your go-to for a glamorous wedding reception look. Sabyasachi’s ivory crystal lehenga with a dual combination of a stole and veil is further enhanced by the addition of a belt. If you want a royal wedding look, then these heavy Sabyasachi lehengas are what you need to look at. They look pretty and I bet you have seen these before, but now you know what they cost. I get that some of these Bridal Sabyasachi Lehenga Prices are mind-boggling. But if it is falling way off your radar, know that others exist in the mid-affordable range as well. You may just have to give up on some really exquisite pieces. Also, almost daily somebody or the other asks me for Sabyasachi ‘inspired’ lehengas in the range of INR 50k to INR 1.5 Lakhs. I say this again and again. Don’t go for these replica lehengas. They can not match up to the original one. Plus, at that price, it’s much better to own an original piece by some other designer instead. If your budget is around 1 Lakh for your wedding lehenga, I recommend you check out the link below for genuine other designer lehengas as well. Never in a million years would I’ve guessed this Sabyasachi lehenga price. No wonder we haven’t seen one too many brides wearing this one yet. This entire 2018 new collection price is quite high. So in case you’ve bookmarked one of these, think again. Also just to give a little perspective. These bridal lehengas are more expensive than Deepika Padukone & Anushka Sharma’s wedding lehengas. You saw their wedding lehenga prices right? Just remember, in this budget, you can pick those celebrity lehengas as well. Sabyasachi Ranibagh jacket is all about couture-meets-bohemian-whimsy. The baroque jacket has been hand-painted, then appliquéd with tea-dyed velvet and over-layered with the zardosi, coffee-stained pearls, rhinestones, crystals and semi-precious stones. It is lined with chintz-printed cotton and over-layered on a voluminous lehenga. It’s sort of funny how on one hand I’ve written and planned entire weddings under 2 lakhs and budget wedding under 10 lakhs. Here, an outfit can cost more than 10 Lakhs! But that’s the power of art for you. 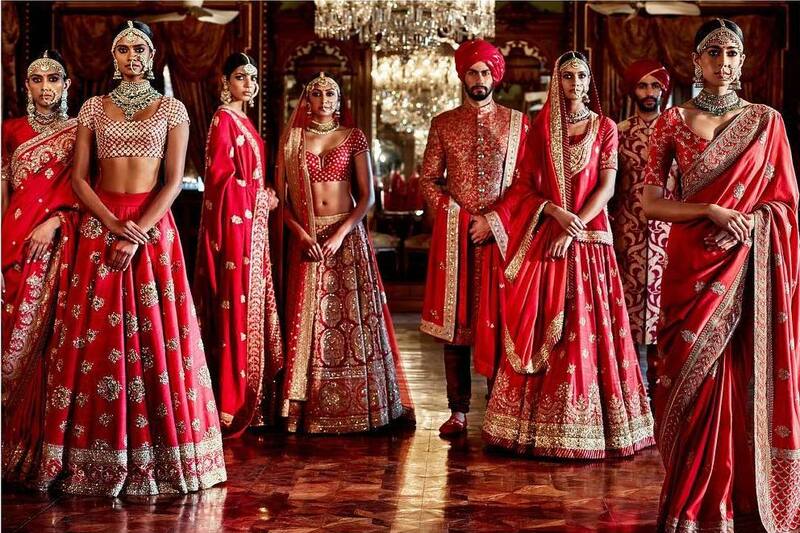 From the looks of it, Sabyasachi has hiked up his new year bridal collection prices. But fret not, you should be good if you stick to an under INR 4 lakhs budget for your lehenga. Sabyasachi’s Coconut Carribean coat in black is worn over a lehenga, making it an ideal choice for a winter wedding. If your heart has sunk looking at all these Bridal Sabyasachi Lehenga Prices, worry not. Sabyasachi also does some budget-friendly pieces as well. Think under INR 2 Lakhs. But, those lehengas you really need to figure out how to make it bridal like. Many real brides have done it in the past. You might want to see the pictures in the links below. All of these lehengas are available to purchase online on Aashni & Co.